When good music hits you, it's like getting kicked in the stomach. And, when that music is totally unexpected ... well, let me just say it is very hard to describe. 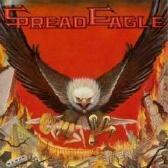 Whatever that feeling is, it hit me when I started listening to Spread Eagle's self-titled CD from 1990. I have never heard anything about the band but, man, what a big surprise it was to hear such a great band that I knew absolutely nothing about! The music is clearly 80s style hair band but I don't mean that in a negative way. Instead, "Spread Eagle" has a Ratt or Motley Crue thing going on throughout the CD that rocked the house. The music is simple and to the point and there are no fillers -- just killer rock'n'roll. Spread Eagle is as good a hair band as I have ever heard and I have heard them all (or so I thought before this one). For more information, check out www.myspace.com/spreadeaglenyc.